Inspiration Board Giveaway by Birthday Girl! 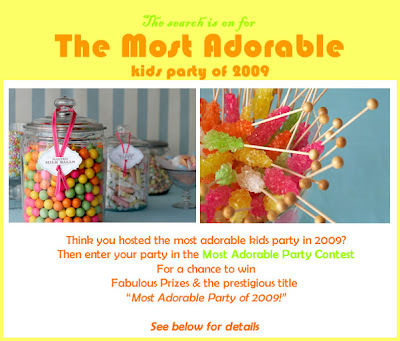 A Great Contest: The Most Adorable Kids Party! 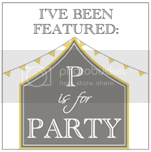 P is for Party is Now on Facebook! 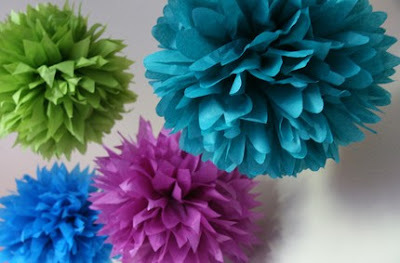 Birthday Girl blog is one of my favorite reads and I have always loved her inspiration boards! 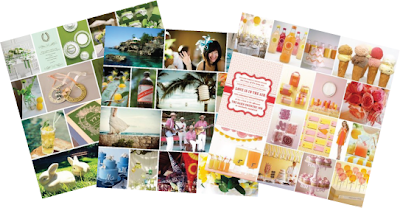 So, I was THRILLED to see that she is hosting an inspiration board giveaway!! It is so easy to enter. 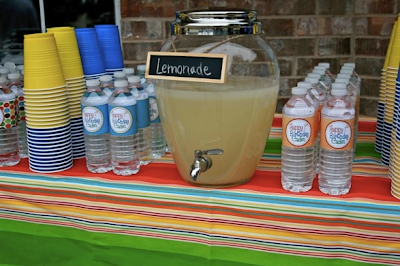 Just click here and leave a comment about an upcoming party you need help with. 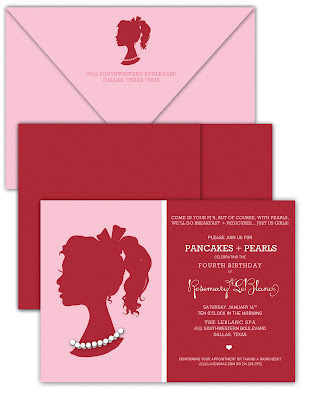 I'm planning a surprise party and would love to see Becca's ideas! What board would you like to see? 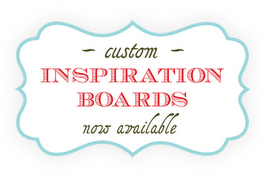 If you are not the lucky winner, fear not, because she is now offering custom inspiration boards for a small fee! 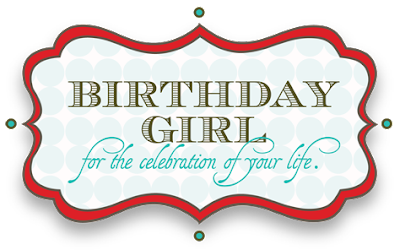 Visit Birthday Girl for lots of inspiration! Do you remember the California Dreamin' and Texas Hoedown party I was telling you about? 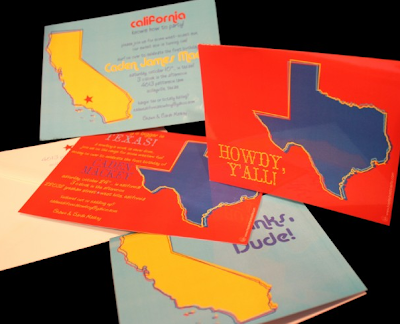 Well, here are the pictures from the California style party that took place in Texas! 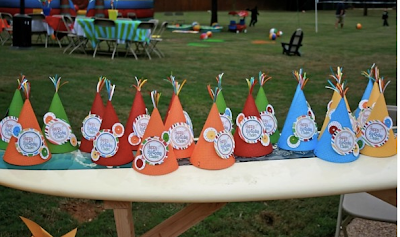 Party hats were displayed on a surfboard table that Sarah's husband constructed. I love this! 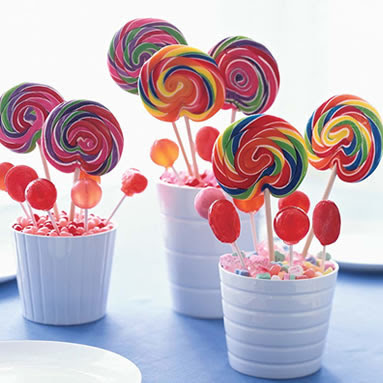 Beach bucket and pinwheel centerpieces...too cute and perfect for a kids party! 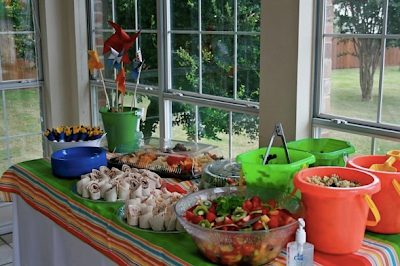 Beach towels were used as tablecloths. 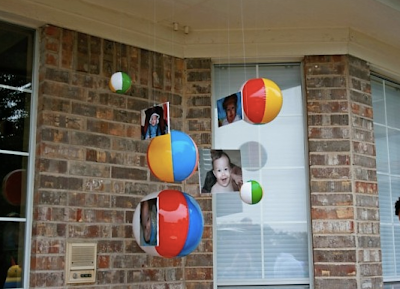 Lanterns and pom poms seem to be the rage, but I love how she hung beach balls instead! 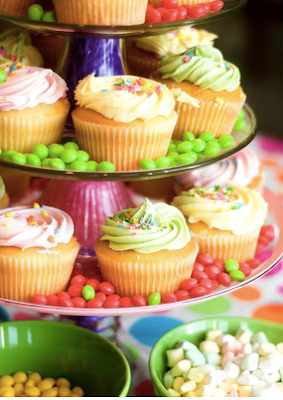 Aren't these cupcakes adorable?! Crushed graham crackers were used to make the "sand" topping. The kids took home beach buckets that were filled with a flip flop sucker, beach ball, bubbles, sunglasses, noise maker and a squirt gun. 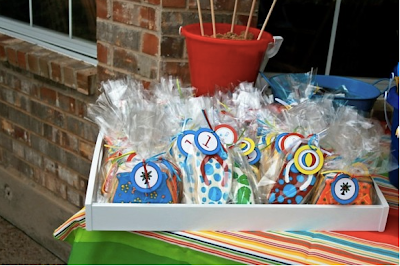 Everyone took home a beach themed cookie too! 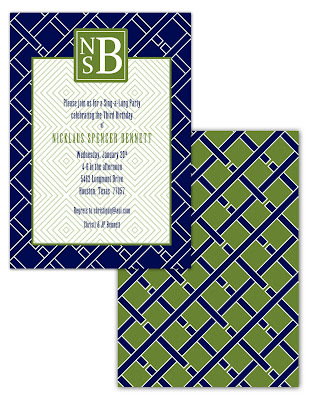 Here is a look at the invitation again. I will share the Western pictures with you soon! 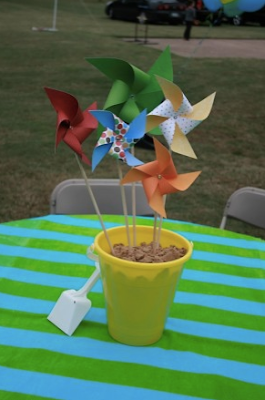 * Sarah, the hostess, made the pinwheels and hats! 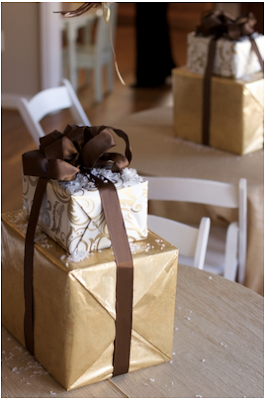 * The favor, bubble and cookie tags came from who else, but The TomKat Studio. 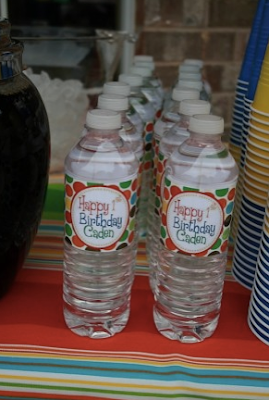 * Invitation and water bottle labels were designed by Hayley Hardcastle. 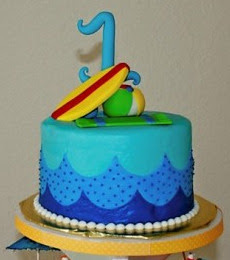 * The cake came from Hot Chocolates in Hurst, Texas and a family member designed the fondant pieces. Stay tuned for pictures from the Hoedown that took place in California! 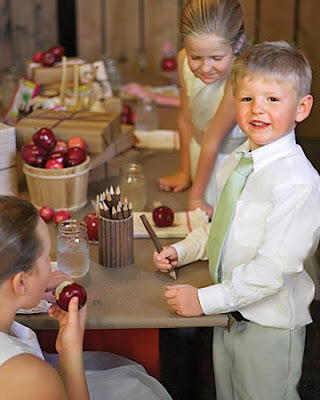 Did you host the MOST ADORABLE kids party in 2009?! 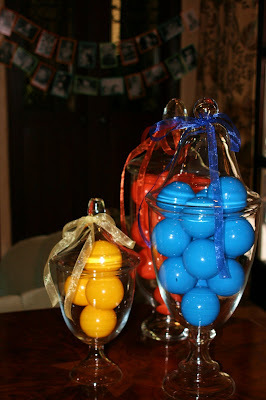 Here is your chance to enter your party into a fantastic contest put on by Jenin of Creative Hostess! An amazing panel of judges will be viewing every party...Jenn from HWTM, Kim from TomKat Studio, Chris from Celebrations at Home and Kelly from The Party Dress! And it is so easy to enter! Click here for directions and to learn about the great prizes! 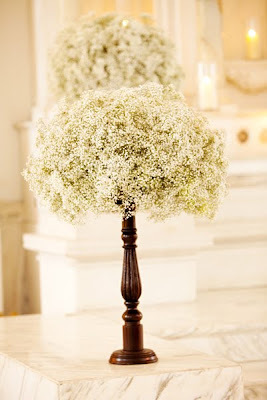 Who knew baby's breath could actually look pretty?! I spotted this stunning wedding over at JL Designs and just saw that Natasha from Fete Fanatic just wrote a post about it too. See more of the gorgeous photos here. 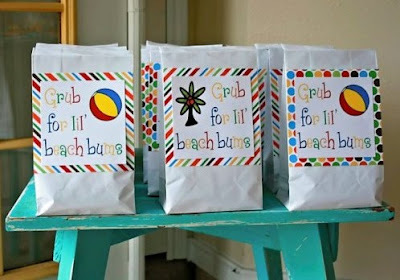 I've been busy getting ready for Nicklaus' sing-a-long party tomorrow, so I am sorry my posts have been few and far between! I can't wait to share the party with you! 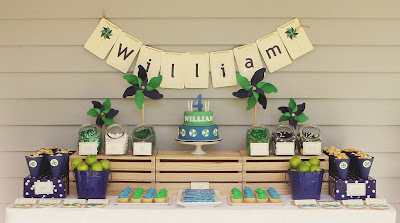 The party colors are navy and kelly green, so it was so fun to see this fabulous party put on by Sharnel in Australia! 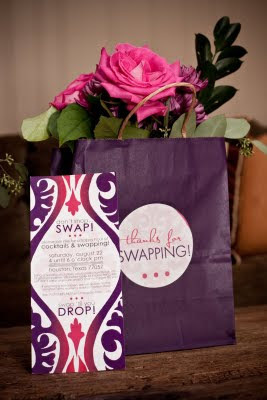 "Swap 'til You Drop" Featured on The Creative Party Place! 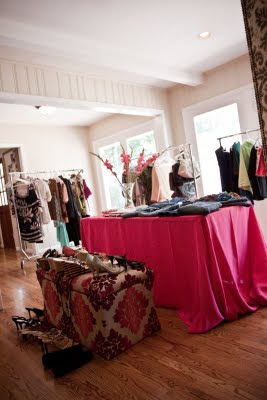 What a thrill to learn that my clothing swap was featured on The Creative Party Place today!! I love visiting that blog for my daily dose of fantastic real parties. 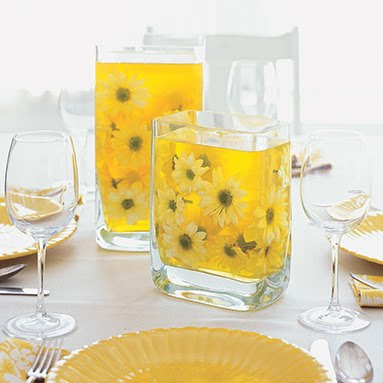 Head on over for lots of party inspiration! To see my original post, click here! 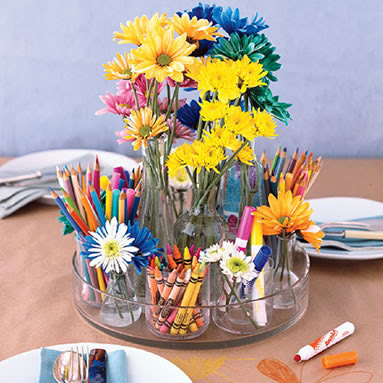 This is such a fun twist on two great themes! 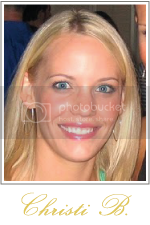 My friend Sarah is originally from California, but has lived in Texas since college. 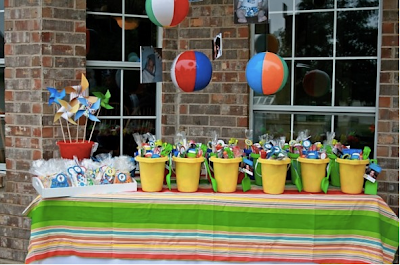 To celebrate her son's first birthday, they threw TWO parties...one back home in California and one in Texas with all of her Texas friends. The party in California had a Western theme to show her family and old friends how we do things here. 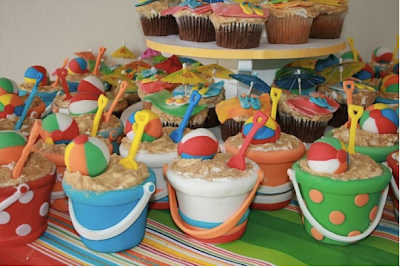 =) Then, the party in Texas had a California beach theme for us Texans to enjoy. Everyone received the two-sided invitation in the mail. 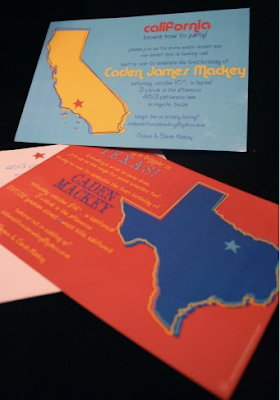 One side had the Texas party details and the other stated the information for the California party guests. I wasn't able to help her in person, but we went back and forth through e-mail to come up with some cute idea. Sarah did a fantastic job with the party decor which I will share very soon. Stay tuned for more! 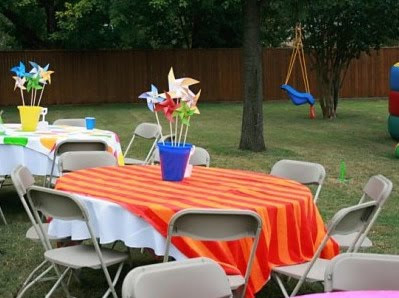 I was so excited because the hostess wanted to use ghost chairs which I have been dying to use! 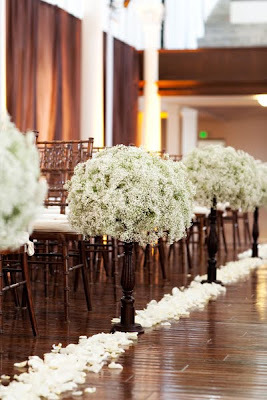 They were gorgeous and gave the space a clean, modern feel. We cleared the living room of all furniture and brought in two long tables that each sat 20 people. 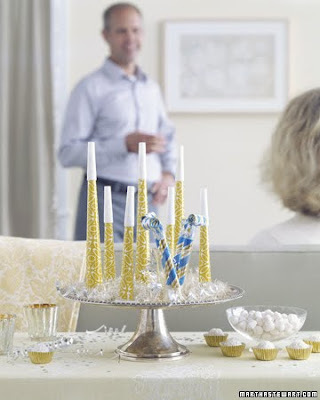 The colors were silver, teal and white which we carried throughout the entire party. 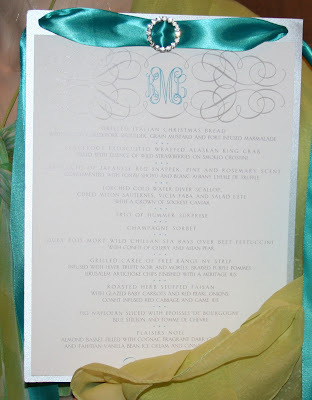 Hayley Hardcastle designed the box invitation as well as the other paper goods like the menu above. 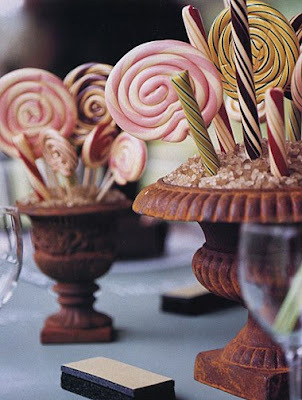 A personal chef catered the event and guests feasted on a 10 course meal. A mannequin (long story!) held a larger menu near the chef's station so guests could take a closer look at what was being prepared. 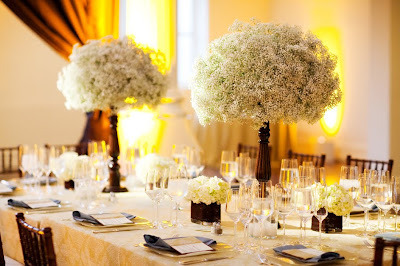 One of the flower arrangements...we used white roses and peonies. 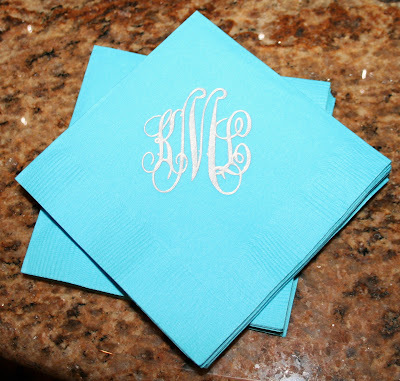 Cocktail napkins with the guest of honor's initials. Again, I apologize for my terrible photography skills! It really was a gorgeous party and I wish I had hired a photographer...oh well! 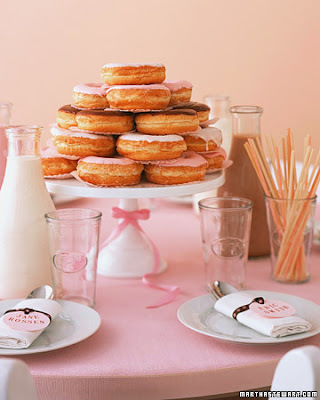 This party is perfect for a little girl's birthday, but the colors and theme would be perfect for a Valentine's party too! 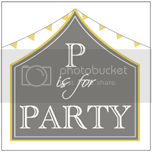 I'm sure I'll have lots of pictures to share with you once the party is over, so stay tuned! 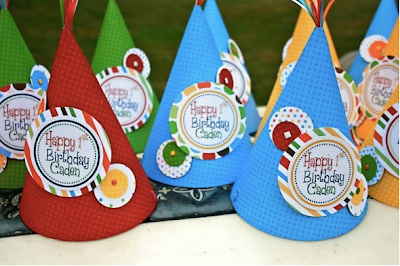 I am really excited about the color scheme and patterns that I am using for Nicklaus' third birthday party...which is right around the corner! Nick is into singing at the moment, so I am having a good friend, who happens to teach preschool choir, come over and lead the kids in silly songs. 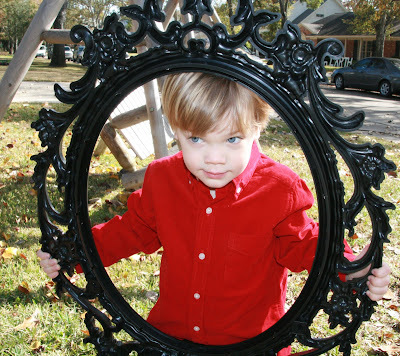 I searched everywhere for a vintage looking frame and just happened to stumble across this one at Ikea. 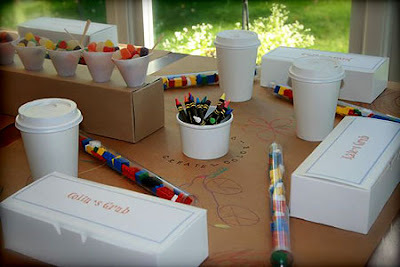 Birthday Girl is one of my FAVORITE blogs, so I was beyond thrilled when Becca featured Conrad's first birthday party!! I am sure you are all familiar with her great site, but if not, head over there right now! Among other things, I really love her inspiration boards.